Galatians 2:19-20— With Christ I am nailed to the cross. And I live, yet not I; but Christ liveth in me. And that I live now in the flesh: I live in the faith of the Son of God, who loved me, and delivered himself for me. We try so hard, even when serving in the Church, to preserve our own lives, even when Jesus clearly said that if we hold on to our lives we would lose them. We will remain as we are. We could spend fifty years studying the Bible and the writings of the Early Fathers, we can read and learn from every book written about the saints and how they succeeded, we can become an expert, and still, we will not see Him. On the pages of the scriptures, you will see Jesus—the One who dwells in such light that when you gaze upon His face you change without trying. II Corinthians 3:18 tells us, “But we all beholding the glory of the Lord with open face" (not covered, no makeup, just the naked face), That kind of person is "transformed into the same image from glory to glory, as by the Spirit of the Lord.” That transformation, that change, can only take place when our hearts are clean. In one of Jesus’ first sermons He told the crowd that had gathered, “Blessed are the clean of heart: for they shall see God.” (Matthew 5:8). But what does it mean to be clean of heart? A clean heart has no self centered life in it, no selfish ambition for itself because that “I” has been crucified. With the clean heart, there is no hindrance from Christ within coming forth because there is no contamination from the self-life. In Matthew 11:29–30, we read one of the most wonderful Scripture portions ever recorded. It is the invitation of Christ to "Take up His yoke upon us, and learn of Him, because He is meek, and humble of heart: and we shall find rest to our souls." For he says, "My yoke is easy ( or in the words of the Douay Rheims 'sweet') and my burden light." When Jesus said, “Take up My yoke upon you ...” we must realize that only a broken animal will bend its neck and take the yoke. take two buffaloes for example. Picture them out in the fields getting ready to be used to plow. —the buffaloes standing there, not making a single noise. They never run away. They just stand there. And right there in the field beside them is this skinny, little man with hardly any clothes on and a tiny stick in his hand. The buffalo bends its neck as the yoke is brought—there is no fight, no resistance, no squabble, nothing. The buffalo simply yields its rights. But then, if you were to look closely, you would see two or three deep scars on the rear of the buffalo. Those scars were made at the time the animal was broken, when it was trained. These buffaloes are strong-willed creatures. With their massive and strong horns, they are capable of killing a man with a single toss of the head. But now they are different. They are broken. Every servant of God must go through a similar process. Paul speaks of bearing on his body “the marks of the Lord Jesus” (Galatians 6:17). Christ was broken on the cross. The whip lashes on His back, the thorn piercing on His head, the nail holes in His hands and feet are His brand marks. They speak forever of the humility He chose to walk in on this earth. Again, we must hear the invitation of Christ—“Come, yield your rights, let go of your own will and take My yoke. It is easy...it is sweet....It is light. Come, learn from Me, for I am meek and humble of heart , and you will find rest to your soul.” What from His life are we to come and learn from? Consider the way Psalm 22:6 speaks of Christ: “But I am a worm and not a man.” It’s talking about Jesus, the Son of God and Savior of the world, It is what He said about Himself as the Son of Man. He was bruised and broken that no one should desire Him, no one should have any attraction toward Him. He was despised and forsaken. Like a sheep that is silent before the shearer, He did not open His mouth in protest to the cruelty He received from the ones He came to save. He simply submitted and chose to be broken. We, too, must choose to be broken. Philippians 2:5–8 tells us, "For let this mind be in you, which was also in Christ Jesus: Who being in the form of God, thought it not robbery to be equal with God: But emptied himself, taking the form of a servant, being made in the likeness of men, and in habit found as a man. He humbled himself, becoming obedient unto death, even to the death of the cross." Being meek and humble of heart, comes through the cross and our choice to embrace brokenness just as Jesus did. Jesus said, “this is my body, which shall be delivered for you” (1 Corinthians 11:24). If you would to read this in most protestant bibles you would read: "this is my body which is broken for you". But Jesus body was not broken. He chose brokenness not in body because then he would have been an imperfect sacrifice. But he chose to be broken in His will. He chose to embrace the cross. He didn’t say to Peter or John, “This is My body. 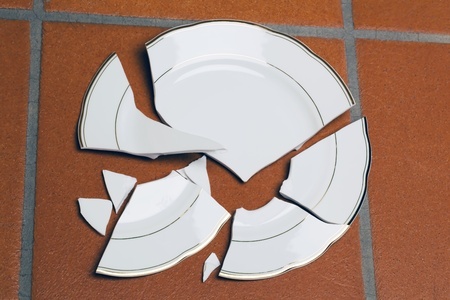 Take it and break it.” He didn’t say, “This is My body that the Father broke into pieces for you.” No. He is the One who humbled Himself and allowed Himself to be broken in the will. As he said to the father in the garden of Gethsemane, "Not my will but thy be done. I want to offer this suggestion: Do not look for some external, supernatural event to change you or the situations of your life. As we heard the other night "Lord see if there be any wicked way in me." Let the Lord show you the corruption in your own heart and be willing to go to the cross by humbling yourself. Be willing to be broken again and again and again and again. This is the only way to have life. As long as we hold onto it, we will lose it. But once we choose to be broken, we will experience the life of Christ in all its fullness. Every time you are discouraged, every time you want to give up, every time you are in conflict with someone, every time there is no peace in your heart, every time you are troubled and distressed, when you feel restlessness, you must understand—the Lord is trying to bring you to the place of brokenness. We become frustrated and upset over our circumstances because we have yet to truly experience what it means to just give up, to become like Christ, like a worm, and totally give up our rights. The cross of Christ continues to work, but you are resisting it. The way of peace, the way to have a life free of striving, only comes through our being broken.